On 1 January 1999, 11 countries of the European Union (EU) fixed their exchange rates, adopted a shared monetary policy under the European Central Bank and launched a new common currency: the euro. It was initially an electronic currency used by financial markets and for cashless payments. Three years later, euro banknotes and coins entered into circulation. Today, the euro is the currency of 19 EU countries and over 340 million Europeans. It is one of the most important currencies in the world. Euro banknotes and coins are tangible, everyday reminders of the freedom, convenience and opportunities that the EU makes possible. How much do you really know about the euro? Take our quiz and test your knowledge of the euro (and the European Central Bank). We have fun questions for newbies and experts. Give it a try and share it on social media! As our currency, the euro has become an integral part of everyday life and it makes it easier for us to trade, travel, study, live and work abroad. At the European Central Bank we look after the euro to provide a stable environment for people living in countries using the euro, including families, workers, employers, entrepreneurs, pensioners, savers and debtors. We contribute to economic growth and welfare by ensuring the stability of the euro. Our currency is the most tangible representation of European integration and it has made us stronger together, said President Mario Draghi at the European Parliament's plenary session on the anniversary of the euro on 15 January 2019. Today, our duty is to complete what was started two decades ago. Small and medium-sized enterprises form the backbone of the euro area economy. Find out how entrepreneurs and small business owners benefit from the single currency. 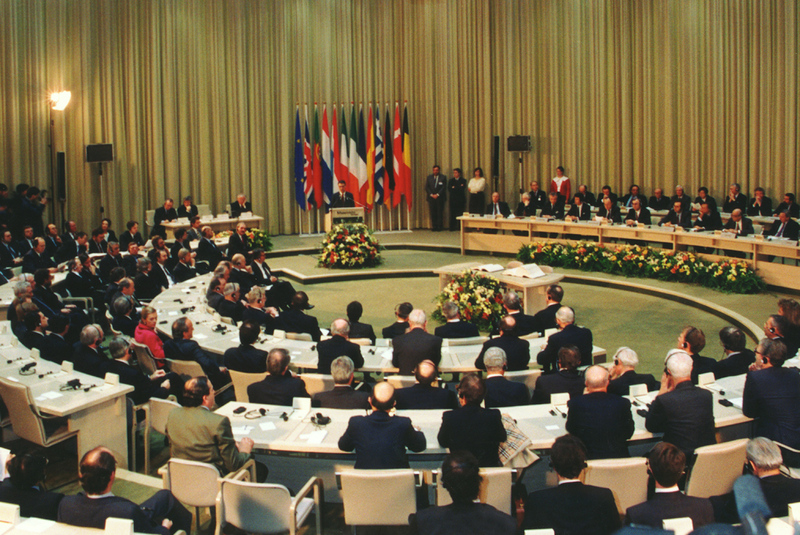 European leaders signed the Maastricht Treaty 25 years ago, a milestone for European integration that paved the way for the euro. Take a look at how our single currency has made it easier for Europeans to travel, study and work abroad. Did you know that the two parallel lines running through the € symbol signify stability? And that the average income in the euro area rose from €20,900 in 1999 – when the euro was introduced – to €33,900 in 2018? The euro has come a long way since the late 1960s, when an economic and monetary union was initially discussed, to today, when it is one of the most important currencies in the world. The euro is a tangible symbol of Europe and its values. Our common currency helps to preserve peace and welfare, and to create conditions for prosperity and an economically stable future. The European Commission celebrated the euro’s extraordinary journey with an event on 3 December 2018 in Brussels. We're about to draw 30 winners for our ECB-QuizClash competition! If you win, you'll receive a push notification from the app by the end of March - make sure you don't miss it! For those who don't already know, we launched this quiz competition in February in collaboration with QuizClash – questions were on topics such as the euro and the European Central Bank. Winners will get to choose either an iPad or an Interrail Global Pass! Our 2019 European Cultural Days will be dedicated to Europe’s common culture and identity. You will find more information on the events in due course on our European Cultural Days web page. The sixth annual ECB Forum on Central Banking will focus on 20 years of European Economic and Monetary Union and takes place in Sintra, Portugal. LOOKING FOR MORE INFORMATION ON THE EURO? We have collected a series of photos and footage from our archive, covering the last 20 years of the euro. Feel free to reuse them and make sure to attribute them to us. Have a look at some of the most recent papers and speeches on the topic of the euro, Economic and Monetary Union and the economic outlook over the past 20 years.